I know I’ve written about poke before but this was our first time to Fresh Catch. I used to think all poke was good poke. I wasn’t picky since I couldn’t eat it any time I wanted to. Beggars can’t be choosers! But I have now found a favorite place to get poke and I don’t know if I can ever love it as much as I do at Fresh Catch. We had heard about Fresh Catch from friends so it was on our growing list of places to eat when we were back in Hawaii. Luckily, there is a location in Kaneohe really close to where my in-laws live. 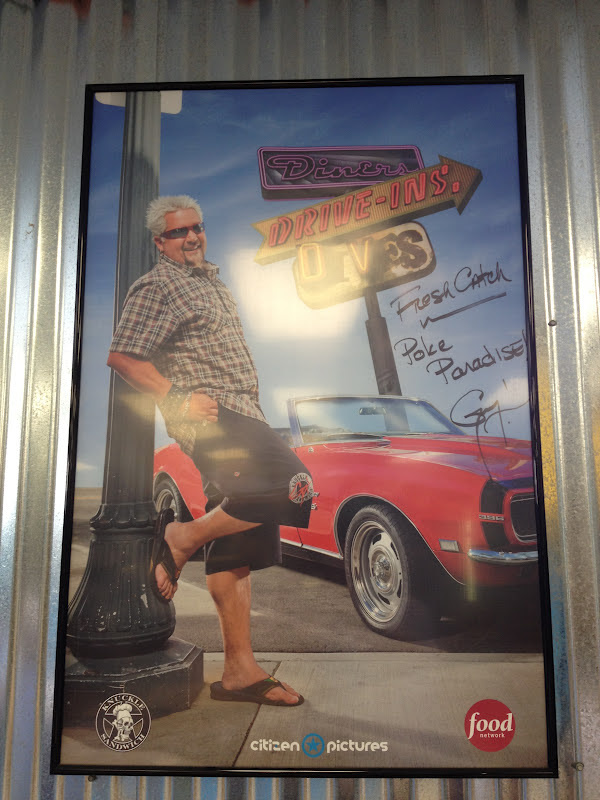 As we walked up to the door, we noticed signs pointing out that this restaurant was going to be featured on Diners, Drive-Ins and Dives with Guy Fieri. There were so many different kinds of poke to choose from, I was in heaven. I ordered a small poke bowl which is your choice of poke with steamed rice. I kept it nice and simple with spicy ahi poke. The fish was so fresh and tasted so good, I was sad that I had ordered such a small bit of it! 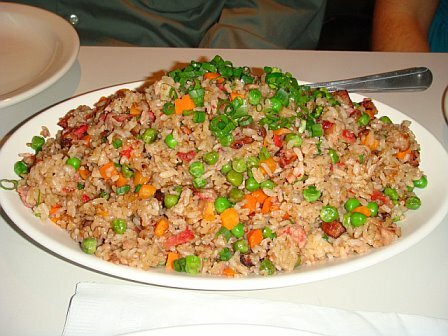 Fresh Catch has an extensive menu with a ton of different plate lunches with lau lau, beef stew, fried rice and more. I will keep going back for the poke though. We went here for lunch on our second to last day in Hawaii. We loved it so much that we actually went back a few hours later to eat more poke again as a snack! We were headed to a friend’s wedding so we went back in our wedding attire before we went to the ceremony. We left Hawaii the next day to come back to the mainland. Before we left, we made a stop at Fresh Catch for our last meal. We learned our lesson and this time we got a bigger poke bowl. Mine is on the left. I got spicy ahi and spicy salmon. TM got shoyu salmon and smoked tako poke. 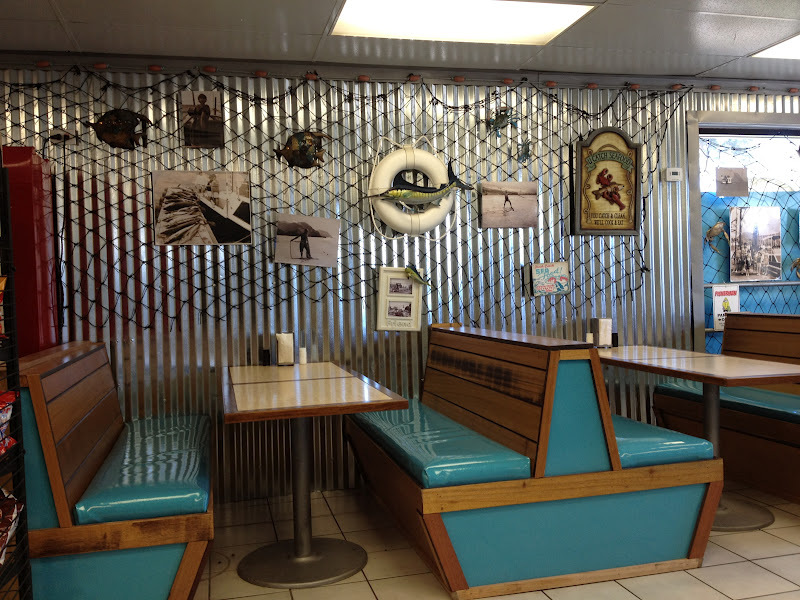 The owner, Reno Henriques, dives for his own octopus and the smoked tako poke is one of the most popular flavors. I have decided this place is a “must go” any time we are back on the islands! As soon as TM and I landed in Hawaii, we had to rush home to catch the end of the Niners game. We managed to see most of the second half of the incredible game they played against the Saints (truly a bummer they lost to the Giants in OT this past weekend) while eating a bunch of goodies my in-laws had picked up for us. TM had put in a request for a bunch of our favorites so we could eat them as an afternoon snack as soon as we got into town! TM loves Genki Sushi. It is a conveyor belt sushi restaurant chain that started in Japan. They now have locations in Hawaii, Seattle, Hong Kong, Singapore and Kuwait as well. Ryan (my brother-in-law) picked up some salmon nigiri for us. TM had forgotten that they serve it with thinly sliced onions and mayo on top. It was perfect. I am not crazy about salmon skin roll but TM loves ordering it whenever we’re at a sushi place. He bases how good a Japanese place is by comparing their salmon skin and spicy tuna to those at Genki Sushi. The salmon skin has just the right amount of crunch to it according to TM. 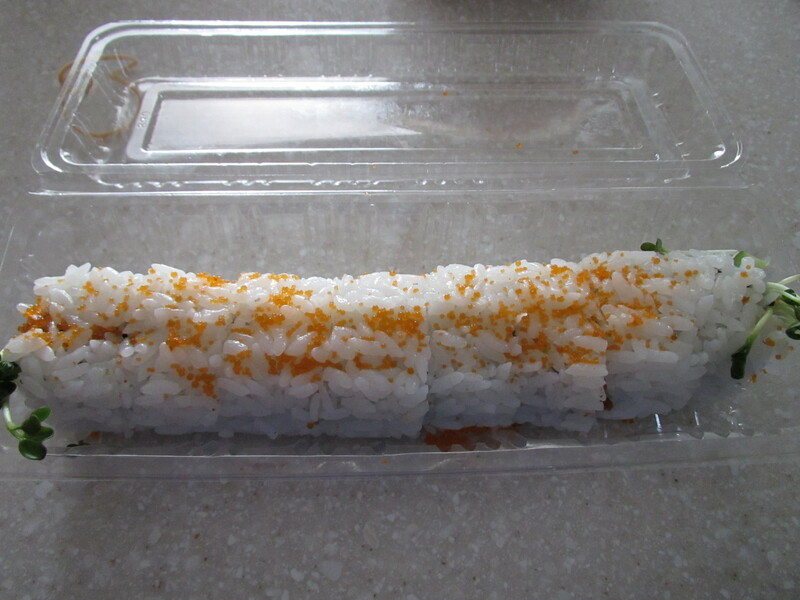 I think TM’s favorite thing to order from Genki Sushi is the spicy tuna roll. We usually order this at sushi places but are often disappointed because a lot of restaurants serve tuna drenched in Sriracha sauce. I love the red rooster as much of the next person but that is not what spicy tuna should be. 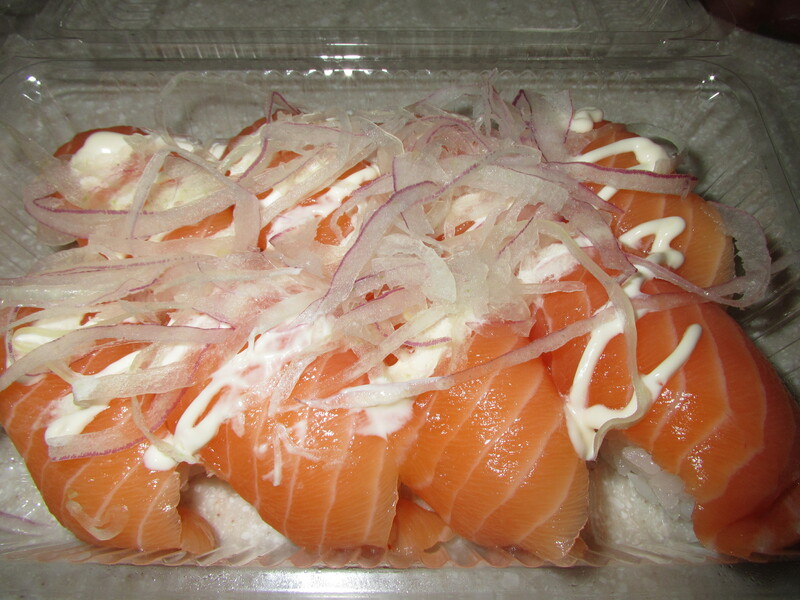 Genki has a great blend of tuna, mayo, chili powder, tobiko, sesame oil and green onions to make up their spicy tuna. When we visited Seattle last year, we were driving around after we had eaten lunch when we saw a Genki Sushi sign. TM’s eyes nearly fell out of their sockets, he was so shocked! We had no idea Genki Sushi had locations outside of Japan and Hawaii. 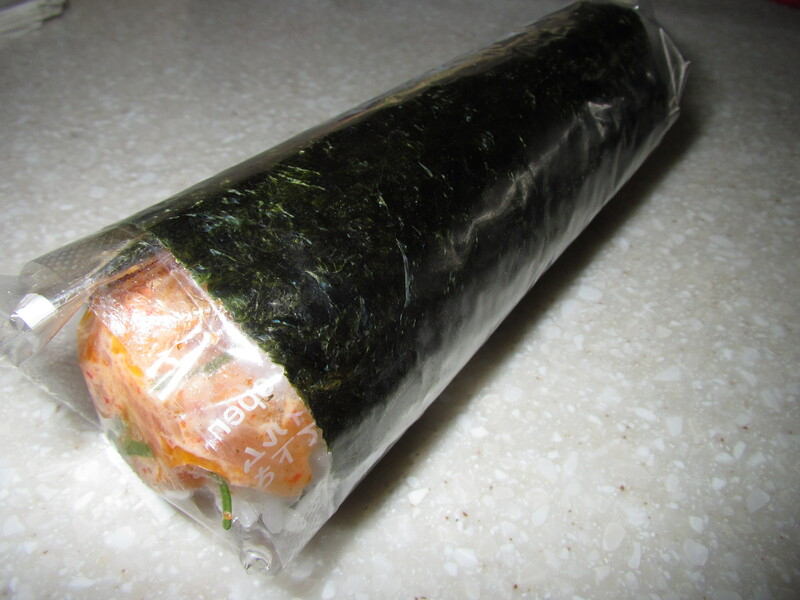 Even though we were full from lunch, TM insisted we pick up a few rolls of spicy tuna to go. That is how much he loves his spicy tuna! 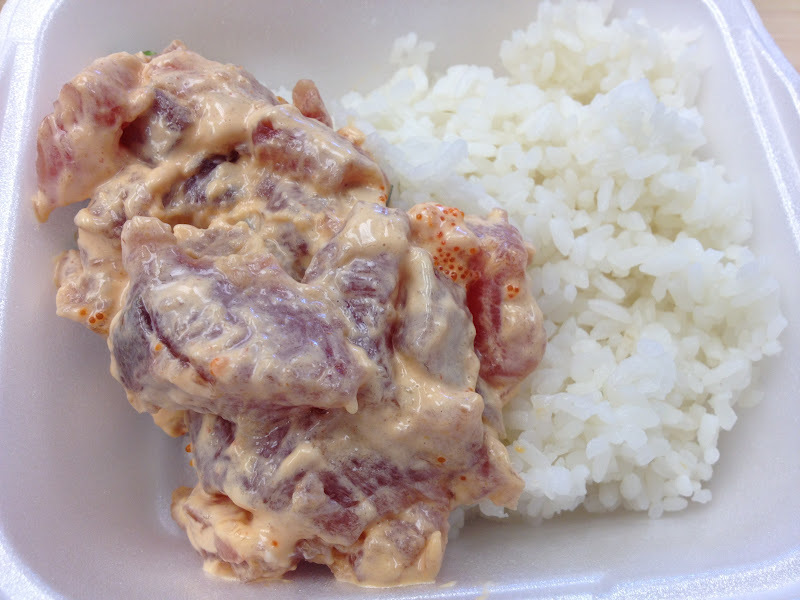 Ryan also picked up spicy poke from Masa & Joyce Fish Market for us. 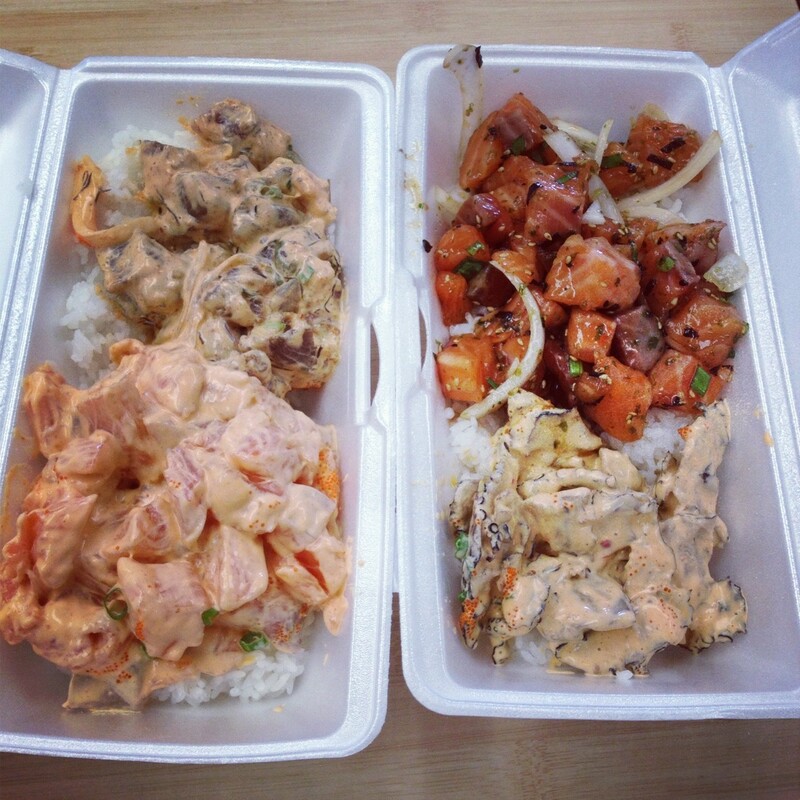 There are so many different kinds of poke with different flavors. 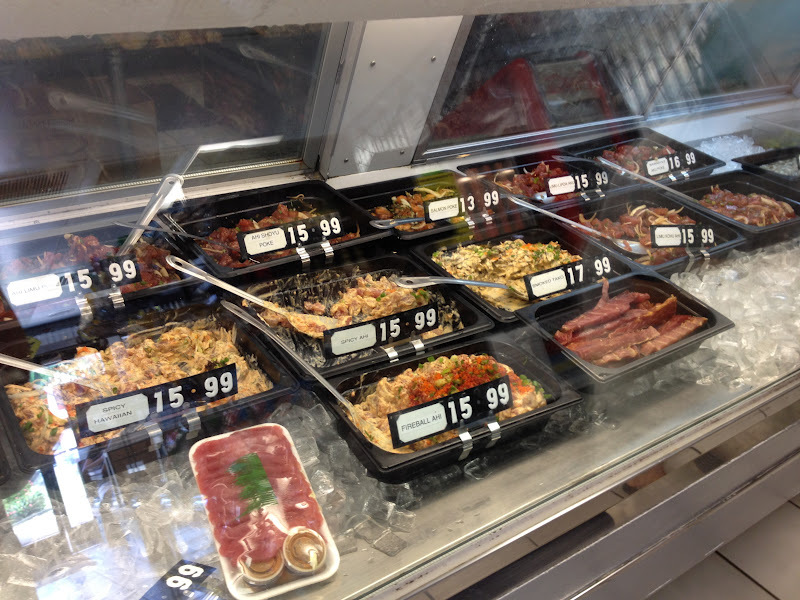 They actually have ahi poke, shoyu (soy sauce) poke, limu (seaweed) poke, tako (octopus) poke, etc. to name a few. Every restaurant seems to have their own variation and every person seems to have their favorite. Personally, I like shoyu poke the best. It doesn’t mask the flavor of the fish, just enhances it in my opinion. 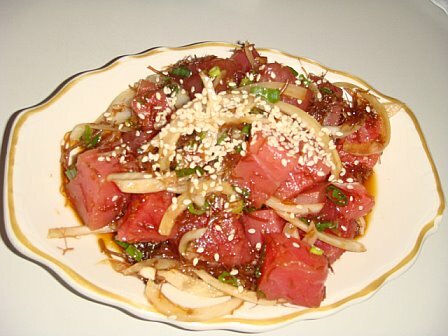 TM likes limu poke the best because of the crunch and flavor of the seaweed. The spicy poke was good although I felt like the spicy flavors covered up a little too much of the fish. 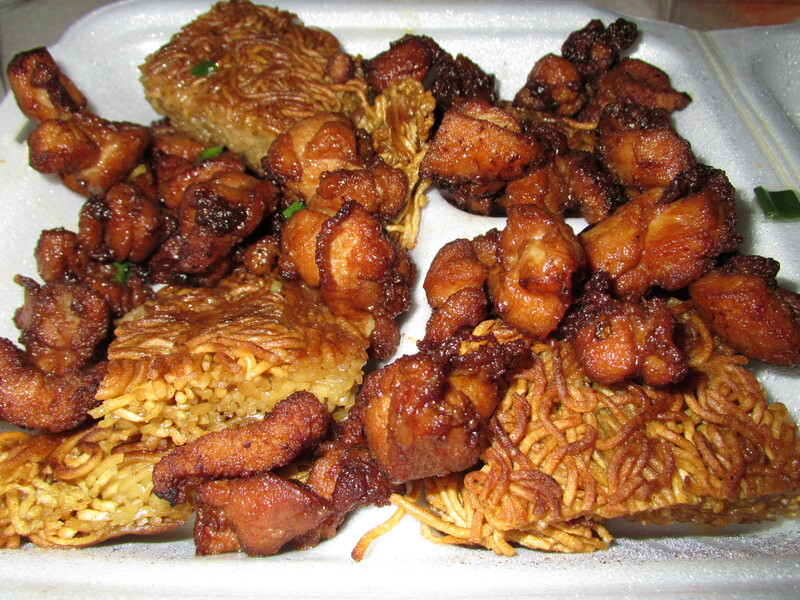 TM’s parents picked up cake noodle with minute chicken from Kin Wah Chop Suey for us. 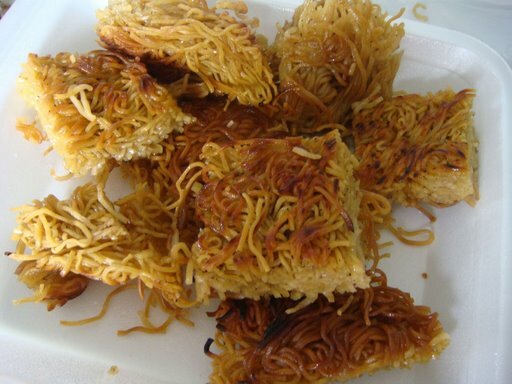 The first time I had cake noodle at a friend’s house in Hawaii, I was in heaven! It seemed genius to pan fry a bunch of noodles together and serve it with oyster sauce and chicken. As a little kid, I used to search for chunks of noodles in chow mein plates so I wouldn’t have to subject myself to any vegetables. Even though I’ve grown up some, I still love noodles and only noodles at times. These were a bit on the oily side but since I rarely get to eat this dish, I figured it was okay. Plus, we were on vacation! TM’s parents also picked up kau yuk with buns from Kin Wah as well. I actually didn’t get to try these because I was so busy eating everything else. These are char siu pork that you wrap in the buns yourself to eat. We were so excited to eat and watch the game that we didn’t even sit down! We stood around the kitchen counter with our chopsticks and took bites of all the amazing food as we walked back and forth between the kitchen and family room. Our crazy nine-day food tour in the 808 had begun!! Did you make any resolutions this year? While I could probably do without dessert for a few weeks and work out more, this post isn’t about dieting. It is about my love for sharing food with others. One of my resolutions for 2012 is to update this blog more. Significantly more than last year. I saw a quote online recently that I decided to make my motto: “Eat Well, Travel Often.” TM and I often travel with our stomachs and I am lucky to have found someone willing to share this motto with me. Our first adventure of 2012 starts this weekend to the Aloha State where TM grew up. It’s been awhile since we’ve been back to the islands and our list of places to eat is twenty-one places deep. Twenty-one! We’ve got breakfast, lunch, snacks, dinner and late night snacks planned out for the short time we’re there and I plan to diligently blog about our journey. I apologize because I’ve probably shared this picture before but poke is one of the things I crave the most when I think about food from the islands. 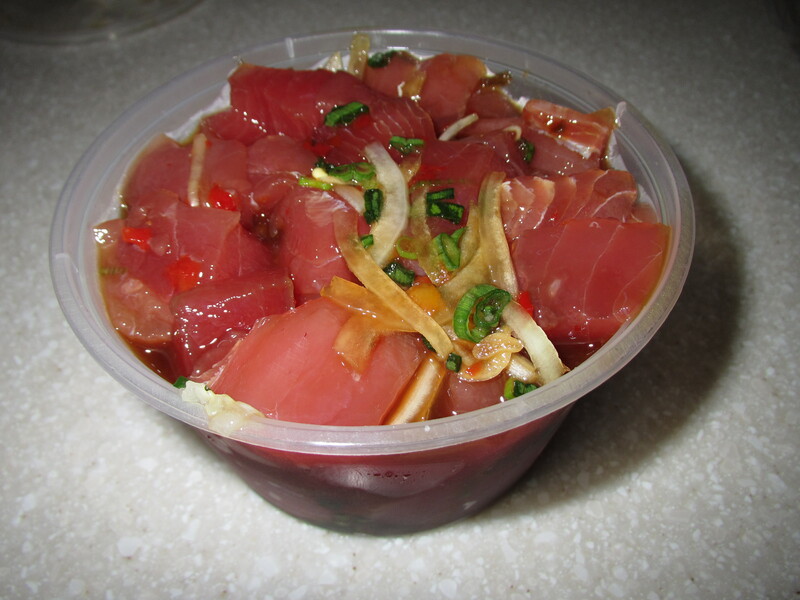 It is a raw fish salad (usually yellowfin tuna) served as an appetizer in Hawaiian cuisine. 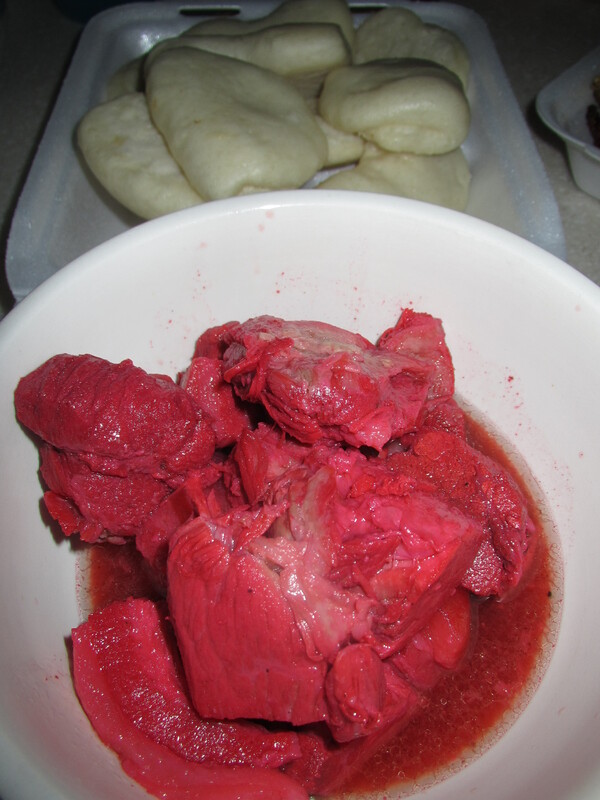 We love picking it up from Foodland or other places and eating it with rice. The last time we were back, we practically went straight from the airport to buy poke to eat as part of our first meal. I am hoping this time we can do the same! One of my favorite places to eat on Oahu is Side Street Inn. 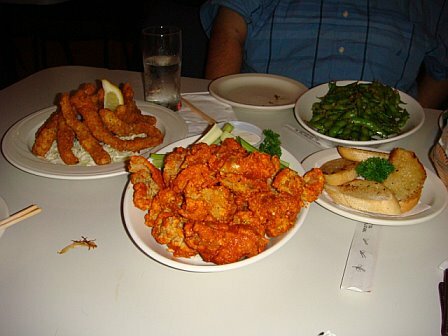 It’s best to go with a big group because the portions are gangous and you always leave with leftovers. We went in a group of nine this time but our eyes were bigger than our stomachs because we had leftovers of practically every dish we ordered! 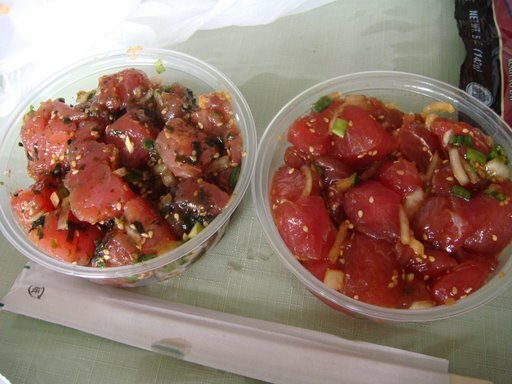 I’m sure that anyone who has read any of my Hawaii entries knows that I LOVE poke. 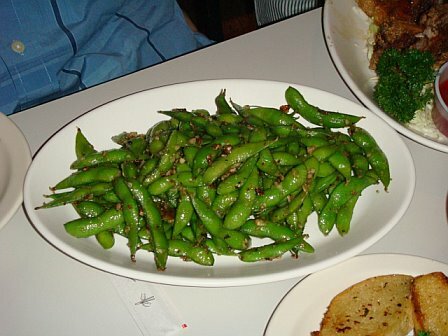 It is a must order at Side Street. I also love their house fried rice and order it every time I go. 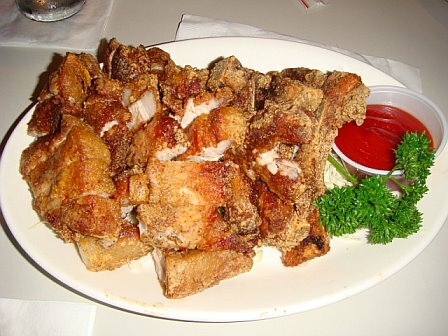 I believe Side Street is best known for their pork chops. I can’t even explain how good they are. I like mine plain (without ketchup) because they have so much flavor on their own! One order is over twenty bucks but well worth it. Boyfriend is such a weirdo, he had never tried them before! I didn’t even try some of the dishes we ordered because they were at the opposite end of the table and also because I was concentrating on my favorite four dishes. 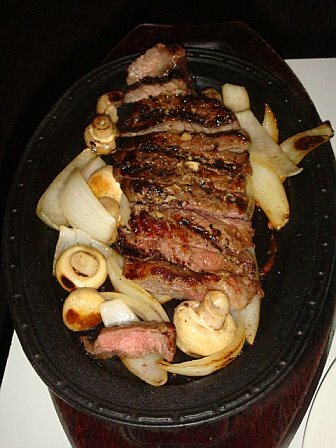 : ) The beef was great and looking at the rest of the pictures, I’m getting hungry. I wish I tried the other dishes as well! 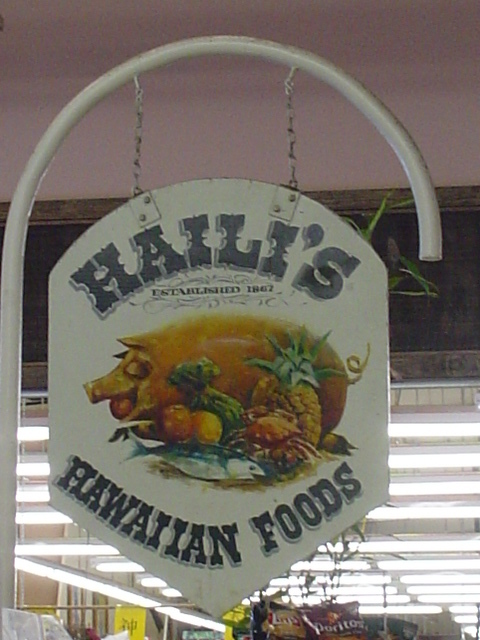 I think the best Hawaiian food on Oahu is from Haili’s in Farmer’s Market, Ono’s on Kapahulu or at grandma’s house. : ) My grandma isn’t on Oahu but I’ve been to plenty other people’s grandma’s houses and there’s always good food! Hmmm, Yama’s and You Hungry? are really good too though… Since I took my family to Ono’s the last time we were in Hawaii, this time I wanted to make sure I made it to Haili’s. 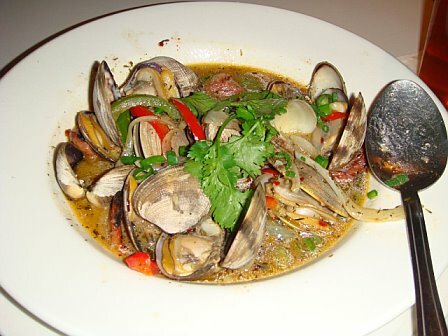 Another reason to go to Haili’s: Boyfriend had never been before! Boyfriend got a combo and didn’t even offer me a bite! I looked over and he was already done with everything… even every last drop of his poi! 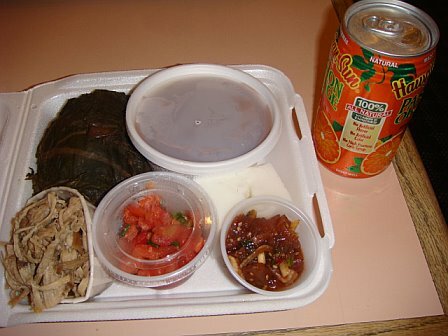 He had kalua pig, lau lau, lomi salmon, poke, poi, haupia and of course, Hawaiian Sun. : ) All that food and I didn’t even get to try. I went for the kalua pig plate (of course!) 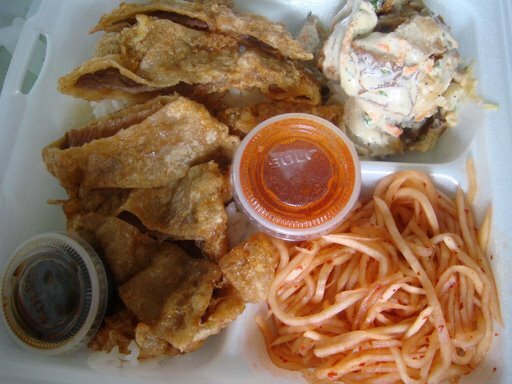 which came with rice, lomi salmon, poke and haupia. 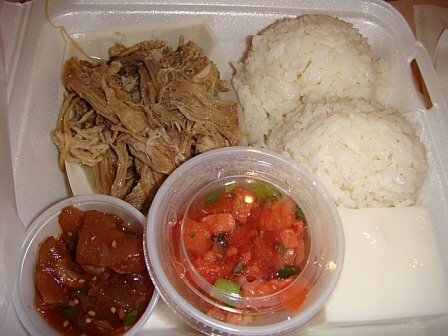 The kalua pig is so soft and moist! There is no picture but we also bought some pipikaula on the side. Pipikaula is like not entirely dried out beef jerkey. My description doesn’t even do it justice… it’s so—o good! We were so limited on time that we had to make a mental list of exactly what and where we wanted to eat in Hawaii. We arrived on Oahu around noon so after dropping our stuff off, we headed straight for lunch. #1 on our list was poke. We picked up some furikake poke and shoyu poke from Foodland. I can’t even remember now which one I liked better but they were both good!! Boyfriend was craving meat jun. It’s a local Korean dish which is basically thin strips of beef (flank steak or whatever) marinated, floured and fried with a shoyu type dipping sauce. I actually prefer mine without any sauce. I was totally craving cake noodle so we made our third stop at a Chinese restaurant to get some! Do you ever order chow mein and wish you could get a bite with more noodles in it? I love the veggies in chow mein but sometimes I wish I could eat a clump of just noodles. For the Love of Food syndicates its weblog posts and Comments using a technology called RSS (Real Simple Syndication). You can use a service like Bloglines to get notified when there are new posts to this weblog.